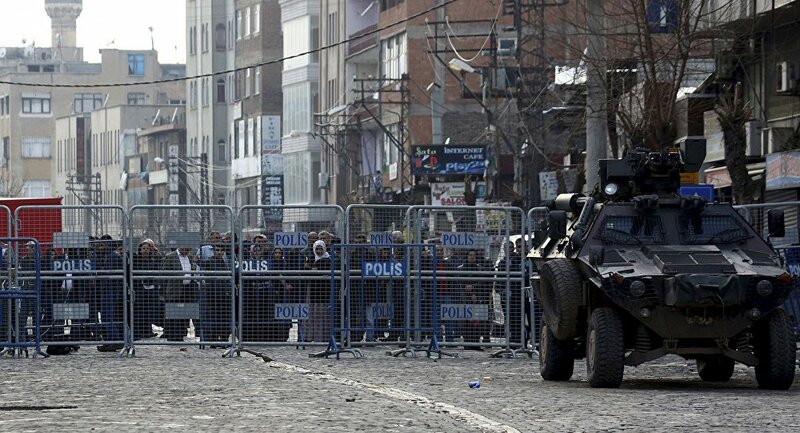 Turkey began enforcing a curfew in Kurdish regions of southeastern Turkey last December. The move has been roundly criticized by rights groups and led to massive protests within the affected communities. During Wednesday's demonstrations, authorities unleashed tear gas and fired water cannons in the city of Diyardbakir before arresting 33 individuals. "The people of Diyarbakir are against the government’s policy of war and massacre and the burning and destruction of their own city," said Selahattin Demirtas, chairman of the People’s Democratic Party (HDP). Located in the district of Sur, the city has been terrorized by the Turkish government as it attempts to hunt down members of the Kurdistan Workers Party (PKK). Some estimates show that thousands of people have been killed across the region during the crackdown, including civilians. On Wednesday, Kamuran Yuksek, Co-Chair of the Kurdish Democratic Regions Party (DBP), told Sputnik that government security forces are also forcing nearly 200 people to remain locked inside a building in Sur, threatening to fire upon them if they come out. "Among these people there are representatives of the youth wing of the PKK, civilian population of the city, children, and the elderly. According to our information, some 200 people are there," he said. "I want to appeal to the Turkish society about the need to unite to oppose such a policy of the Justice and Development Party’s government in Ankara. The authorities’ actions create a serious, deep division in our society." A number of rights activists have called on the international community to condemn Turkey’s actions. "We would like for Russia to bring this issue at the UNSC and so that the Security Council makes a resolution. We are working on this with Russian authorities and diplomats," Kurdistan National Congress spokesman Selahattin Soro told RIA Novosti. "According to our figures, around 5,000 have died if we count everyone, including civilians, Kurdish militants, police, and soldiers," he added. "I think these numbers are lowered. Just in the city of Cizre, there were several reports of hundreds of Kurdish activists who came under fire. Actually, there aren’t any precise numbers, the Turkish authorities don’t allow the collection of these data and don’t share the information with anyone else."